Vivo V11 Pro has completely defeated his previous smartphone V9 in the case of look. 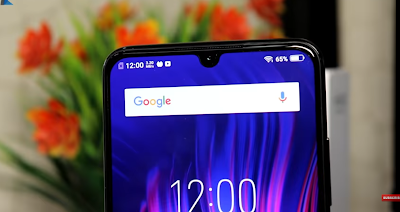 The water drop Notch on the front of the phone offers a special look to the phone. Vivo's experiment in the design of this phone in the case of Notch seems to be successful. The phone also has these display fingerprint sensors. But like Vivo's other phones this feature has become a little fast. There is also a Face Unlock feature. But every time the device had to wake up to use the Face Unlock feature The rear of the phone gives the premium look. In case of look this device will not disappoint you. The device we had had a color striker Pink. The company has also provided free cover in the box with the phone. Along with this, the screen protector on the phone gets pre-installed. Talking about the phone's display, the company has given full visual display 3.0 with super Amoled panels in it. With 6.41 inch display, the viewing experience in the phone is good. From large and full view displays, gaming to video streaming gives all the tasks a good experience. Its screen is full HD Plus with 2340 x 1080 pixels. The colors and contrast of the display are rich. The Vivo V11 Pro has 8 Kryo 260 cores with Snapdragon 660 and Adreno 512GPU. With 6GB of RAM, 128GB of internal storage is provided in the phone. The 3.5mm jack has been given on the bottom of the phone. The phone supports OTG and USB 2.0 with Dual Nano SIM tray. In addition to the Dual SIM phone, the MicroSD card slot is also available for expandable storage. Single speaker with micro USB port has been given at the bottom of the phone. It also has sound loud and clear with single speaker. However, it can be called average only. The earpiece speaker is given above the water drop Notch. The phone works on Android 8.1 Oreo. Speaking of performance, the plastic body of the phone obviously does not work as a good transmitter for heat like a metal or glass body. However, during the gaming, the phone did not heat up too much. In the case of the camera, let us know, Vivo V11 Pro mostly clicks the picture in the condition. But if you are expecting something different from professional photography or camera and over the top, then this phone is not for you. It's a basic smartphone camera that takes good low-light to high contrast shots. Its rear camera comes with 1.28 micron pixels with 12MP f / 1.8. With this, 5MP f / 2.4 camera is given for Bokeh shots. A 25MP f / 2.0 camera is provided on its front. From HDR mode to professional mode, AR stickers, AI photography etc. have been given. The picture gets completely screwed when the object moves on a bit while taking a picture. It can be called a minus point.